I am very picky about my laundry detergent. I’ve tried them all! They either have a harsh scent, irritating dyes, too thick or thin, or they just don’t work. This year, I finally found one that has everything I look for in a perfect detergent and it actually works! The smell is amazing, the consistency is on point, and the bottle is stylish. My laundry detergent obsession right now is the ultra-concentrated detergent from Grove Collaborative. One 24oz bottle washes 33 loads of laundry! It’s available in unscented Free & Clear formula, lavender & rosemary, or Citrus & Woods. I love all three. A plant-based detergent that works! 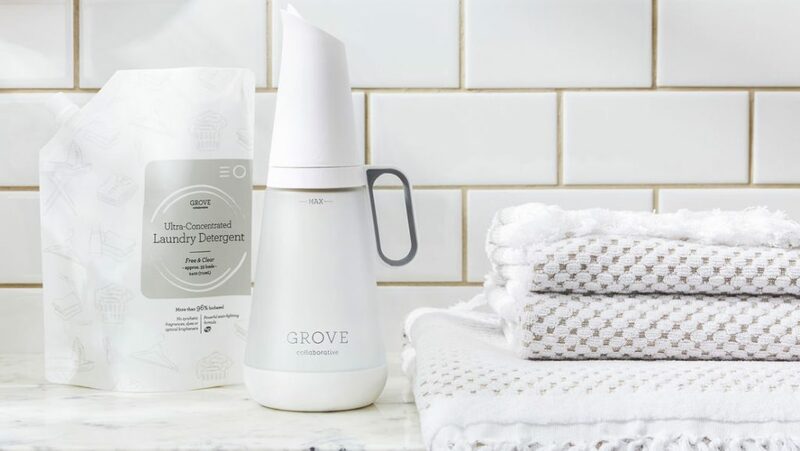 Grove created plant-based detergent that work just as well as, if not better, than top brands. Made with natural cleaning enzymes that can remove any kind of stain. You don’t have to worry about grass-stained knees or wine-soaked linens. Their patented reusable glass dispenser ensures the perfect soap amount, every time. There’s no need to hand measure anymore because of the auto-measuring mechanism. It’s so neat! When it’s time to refill, just pour the detergent from the pouch into the vessel and you’re ready for the next load, without any wasteful plastic dispensers. The detergent is made with ingredients that are derived from plants. It’s over 96% bio-based and uses natural cleaning enzymes to tackle dirt and stains. They created formulas with four enzymes that can take on any stain, so you won’t miss any cleaning power. The fragrances smell like nature because well, they’re actually made with plants, flowers and herbs, not synthetics. Or they have no scent at all. You don’t have to worry about dyes and brighteners because they don’t use them. Compared to most 40oz laundry detergents, the Grove laundry system cuts plastic waste by 80%! How is that for saving the environment? 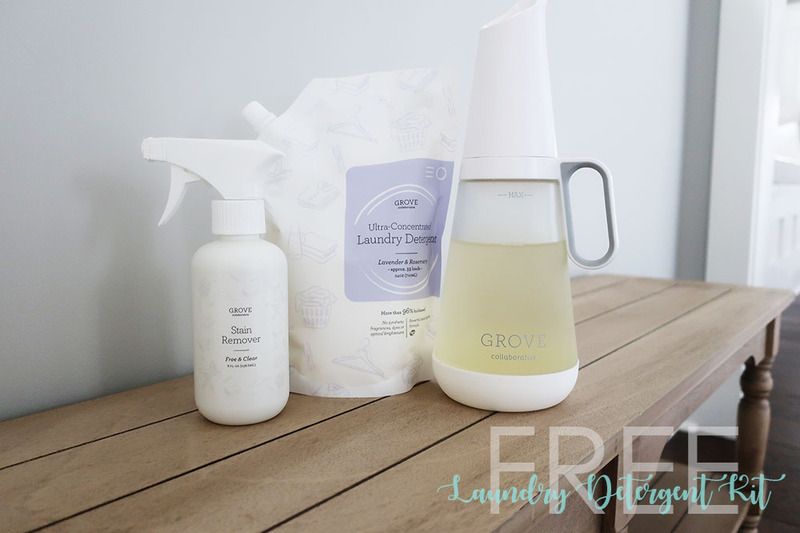 If you want to try out the new Grove Collaborative Laundry Detergent system, you are in luck. This week, I am offering a free special for new Grove customers who spend $20 on your first order. You get all of this for FREE! 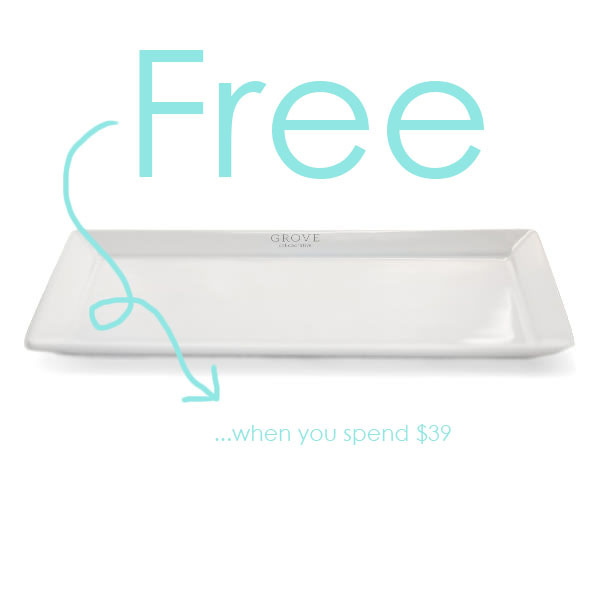 DETAILS: When new customers spend $39 or more, they will also receive a free Grove sink-side tray, in addition to the other free items! Existing customers, we didn’t forget about you. You will receive a free set of Grove walnut scrubber sponges. Grove only ships to the lower 48 states at this time — no shipping to Canada, Hawaii or Alaska. Disclaimer: This is a sponsored post by Grove Collaborative®. All opinions are my own & I only recommend products or services I use personally and believe my readers will enjoy. I am disclosing this in accordance with the Federal Trade Commission’s 16 CFR, Part 255: “Guides Concerning the Use of Endorsements and Testimonials in Advertising. Please click here for full disclaimer.